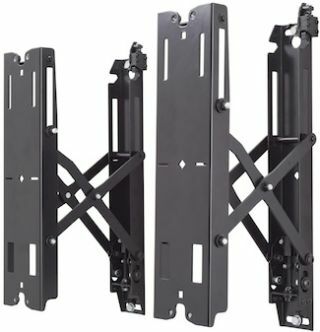 Chief will be bringing new Fusion mount sizes and a pull-out accessory to InfoComm (booth C5408) to further enhance the Fusion series of flat panel mounting solutions. The MTMS1U medium tilt wall mount uses less wall space, so it can hide better behind landscape and portrait installs of narrow-bezel displays in the 32-47-inch range. The STMS1U works well with displays between 24–32 inches to provide support for the increasing usage of smaller displays in digital signage and other applications. Both single stud mounts come with Fusion’s features: ControlZone Leveling allows post-installation fine-tuning of height and leveling; Centris Tilt uses the center of gravity to balance the screen while maintaining a low profile; ClickConnect makes an audible click when the mount is safely engaged with the display; and post-installation lateral positioning enhances ease of adjustment. The new FCAV1U accessory adds pull-out capabilities to any new dual stud Fusion fixed and tilt wall mount. This accessory provides greater flexibility to inventories and can be added to installs for easier servicing, especially in recessed applications. New pull-out features include same depth dimensions as old Fusion pull-out mounts; up to 11.54 inches (293 millimeters) extension when combined with a Fusion mount; optional lock to secure mount in home position; plumb adjust to keep display in line with the wall; and it can be used with tilt mounts and X-Large Fusion for increased mounting patterns. The accessory will be available in June, and previous Fusion pull-out mounts will be phased out in August. The new small and medium mounts will ship later in September.